Plectere features an oversized knitted structure made from thick strips of woollen felt that double as a divider and acoustic panelling in offices. The curtains are the result of Vonk's ongoing experiments with combining knitting techniques and unusual materials. The 3D-knitted structure creates a flexible, semi-transparent curtain that can be produced in a wide variety of lengths, width and colours. "The use of thick wool felt created an interesting structure with unprecedented stability that I could not have previously realised with a knit object," Vonk told Dezeen. "This opened the way for the further development of the stable 3D knit structure of Plectere." 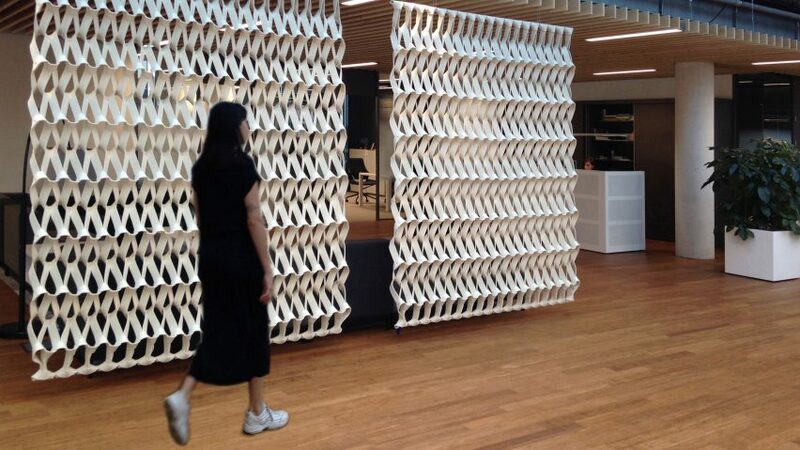 The felt acts as a noise absorber, meaning that the resulting design can act as both a space divider and an acoustic panel. "When Plectere is hung in front of a glass wall with a spatial cavity, it absorbs both high and low-frequency sound waves," added Vonk. 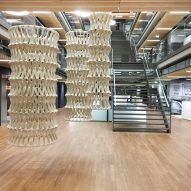 The knitted curtains hang from modular tubing or from wooden poles, which are suspended from a ceiling and come in a variety of shapes. Plectere Aline is attached to straight poles at the top and the bottom to create a flat panel. 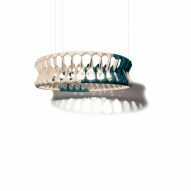 Plectere Curve is hung from curved pieces to create hanging tubes of the textile or more organic, wavy lengths. There are also versions with LED lights incorporated into the poles. Plectere Frame is stretched on a smaller wooden frame that is easy to move, making it suitable as a temporary room divider. "The transparency of Plectere allows the user to demarcate spaces without hermetically sealing them off," said the designer. Plectere was on show as part of the Object Rotterdam design fair in The Netherlands in February. Earlier in the month, Dezeen reported from Stockholm Furniture Fair on a growing trend for work "pods" and modular meeting rooms that can be installed in open-plan offices. 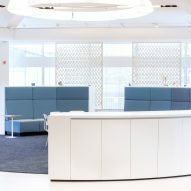 Noise reduction in office interiors has been a key focus in Scandinavian design over the last few years, with a plethora of innovative sound-absorbing wall panels, upholstered desk screens and a wide array of acoustic baffles. Now designers across Europe are responding to the need for more privacy and a focus on wellbeing in the office. Vonk told Dezeen that office interiors also need tactile designs to introduce a sense of warmth. "Nowadays we ask a lot from our employees, and this calls for a pleasant and efficient work environment," said Vonk. "Acoustics and ambiance play an important part in this. Through more privacy, pleasant acoustics, comfort and tactility on the work floor, employees perform better." 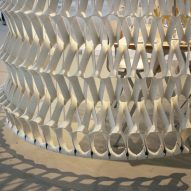 Vonk established her studio in Amsterdam in 1990 after graduating from Design Academy Eindhoven. 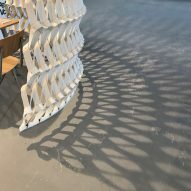 She originally worked in textile design for the fashion industry but became frustrated by the impermanence of the products the sector was creating, so began focusing on scaling up her knitted works for use in interiors and architectural projects 15 years ago. "My goal now is to make intriguing textiles with the use of transparency and layering to create fascinating beautiful patterns which improve the well being of spaces," she said.